Reflow soldering is a process by which the solder paste is heated and changes to a molten state in order to connect components pins and PCB pads together permanently. There are four steps/zones to this process -- preheating, soaking, reflow and cooling. ▪ Preheating zone: Preheat usually refers to increasing the temperature from normal temperature to 150° C and from 150 °C to 180 C. The temperature ramp from normal to 150° C is less than 5° C /sec (at 1.5 ° C ~ 3 ° C / sec), and the time between 150° C to 180 ° C is around 60 ~ 220 sec. The benefit of the slow warm up is to let solvent and water in the paste vapour come out on time. It also lets big components heat up consistently with other small components. ▪ Soaking zone: The preheating period from 150 ° C to the alloy molten point is also known as the soaking period, which means the flux is getting active and is removing the oxidized substitute on the metal surface so it is ready to make a good solder joint between components pins and PCB pads. ▪ Reflow zone: The reflow zone, also referred to as the “time above liquidus” (TAL), is the part of the process where the highest temperature is reached. A common peak temperature is 20–40 °C above liquidus. 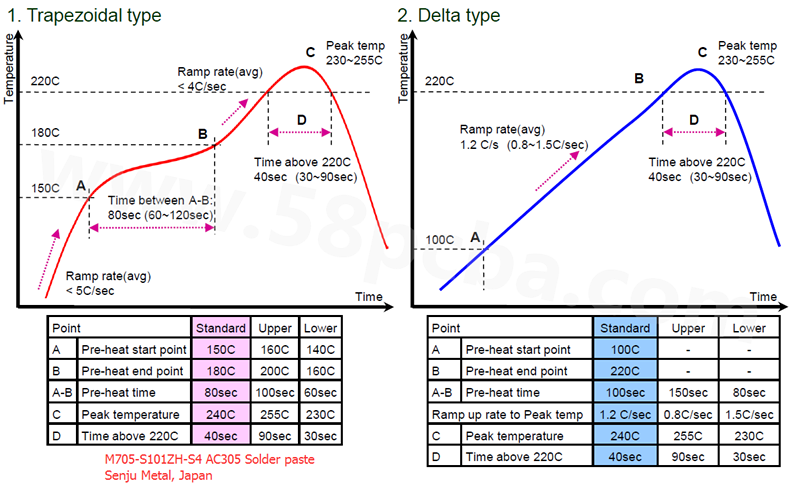 ▪ Cooling zone: In the cooling zone, the temperature is gradually decreasing and makes solid solder joints. The maximum allowable cooling down slope needs to be considered in order to avoid any defect from occurring. A cooling rate of 4°C/s is recommended. There are two different profiles involved in the reflow process – soaking type and slumping type. The Soaking type is similar to a trapezoidal shape while the slumping type has a delta shape. If the board is simple and there are no complex components such BGAs or big components on the board, the slumping type profile will be the better choice. What are the sensors used underwater? Are PCB design jobs good? What are the multilayers of PCB?